Macron’s visit to Iran would be the first by a French head of state or government since 1976. Widening transatlantic divisions are coming into focus as traditional U.S. allies are recoiling at U.S. President Donald Trump’s attempts to undermine the nuclear deal with Iran. 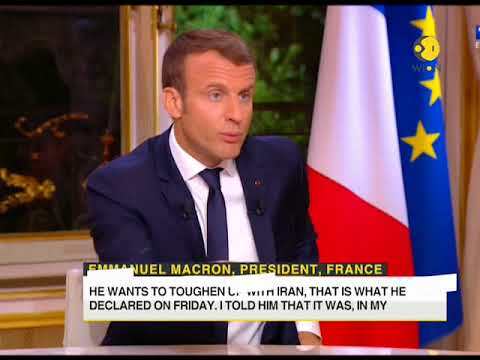 The divide was underscored Sunday as French President Emmanuel Macron suggested that Trump disregarded his allies’ advice and pursued a “bad” policy on Iran. “A trip to Iran by the president, at the invitation of President Rouhani, has been considered,” the Elysee said, while the Iranian presidential website said the visit would happen next year. Rouhani assured Macron that Iran in turn “will continue to carry out its commitments” in the nuclear accord, the Elysee said. The French leader added that it was also necessary to have a dialogue with Iran on other strategic issues including Tehran’s ballistic missile programme and stability in the region. Macron also spoke to Rouhani of his “wish to work with Iran for a lasting political solution to the Syrian crisis.” Tehran is a supporter of President Bashar al-Assad’s regime. Macron’s visit to Iran would be the first by a French head of state or government since 1976. French Foreign Minister Jean-Yves Le Drian is set to travel to the Islamic Republic in the next few weeks. Trump has stopped short of withdrawing the United States from an international accord signed with Iran in 2015, which seeks to ensure that Tehran would place limitations on its nuclear program in exchange for the removal of some sanctions. Trump had repeatedly lambasted the six-party pact as the “stupidest” and “one of the worst and most one-sided transactions the United States has ever entered into” in history. While the former reality television celebrity did not pull the United States out of the agreement, he gave the U.S. Congress 60 days to decide whether to reimpose economic sanctions on Tehran that were lifted under the pact. Liberal newspaper Aftab-e Yazd placed the title “He Just Nagged” on its front page, while official government organ Iran’s front page described his speech as “Failed Chest-Thumping” and anti-Iranian rambling meant to cover his retreat in the face of pressures supporting the accord. Iranian Foreign Minister Mohammad Javad Zarif told European media outlets his country would continue to abide by the deal if Europe did too, according to Germany’s DPA news agency.